For other uses, see North Caucasus (disambiguation). The North Caucasus (Russian: Се́верный Кавка́з, IPA: [ˈsʲevʲɪrnɨj kɐfˈkas]) or Ciscaucasia is the northern part of the Caucasus region between the Sea of Azov and Black Sea on the west and the Caspian Sea on the east, in Russia. Geographically, the Northern Caucasus (territory north of the Greater Caucasus Range) includes the Russian republics and krais of the North Caucasus. As part of the Russian Federation, the Northern Caucasus region is included in the North Caucasian and Southern Federal Districts and consists of Krasnodar Krai, Stavropol Krai, and the constituent republics, approximately from west to east: the Republic of Adygea, Karachay–Cherkessia, Kabardino-Balkaria, North Ossetia–Alania, Ingushetia, Chechnya, and the Republic of Dagestan. Geographically, the term North Caucasus also refers to the northern slope and western extremity of the Caucasus Major mountain range, as well as a part of its southern slope to the West (until the Psou River in Abkhazia). The Forecaucasus steppe area is often also encompassed under the notion of "Ciscaucasus", thus the northern boundary of the Forecaucasus steppe is generally considered to be the Manych River. Ciscaucasus was historically covered by the Pontic steppe, mostly on fertile calcareous chernozyom soils, which has been almost completely tilled and grazed. It is bounded by the Sea of Azov on the west, and the Caspian Sea on the east. According to the Concise Atlas of the World, Second Edition (2008), the Ciscaucasus region lies on the European side of the "commonly-accepted division" that separates Europe from Asia. The outer border of the Soviet Union's North Caucasus Krai was the same as that of present-day North Caucasus Economic Region (Raion) which includes an oblast (Rostov Oblast), two krais (Krasnodar Krai and Stavropol Krai), and seven republics. The former North Caucasus Military District (Okrug) also included Astrakhan Oblast, Volgograd Oblast, and the Republic of Kalmykia. Its administrative center was Rostov-on-Don until 10 January 1934, Pyatigorsk until January 1936, then Ordzhonikidze (today Vladikavkaz) and, from 15 December 1936, Voroshilovsk (today Stavropol). In 2011, the Russian government has put forward plans to create a "North Caucasian version of Silicon Valley", at a cost of 32 billion rubles ($1.1 billion) as part of ongoing efforts to generate opportunities in the region. ^ "Проект «Кремниевой долины» на Северном Кавказе обойдется в 32 млрд рублей" Proekt "Kreminevoj doliny" na Severnom Kavkaze obojdetsya v 32 mlrd rublej [The "Silicon Valley" project in the North Caucasus will cost 32 billion rubles]. Forbes.ru (in Russian). Moscow: Forbes. 25 August 2011. Retrieved 27 March 2017. This Russian location article is a stub. You can help Wikipedia by expanding it. Stavropol Krai is a federal subject of Russia. It is geographically located in the North Caucasus region in Southern Russia, and is administratively part of the North Caucasian Federal District. Stavropol Krai has a population of 2,786,281 (2010). Krasnodar Krai is a federal subject of Russia, located in the North Caucasus region in Southern Russia and administratively a part of the Southern Federal District. Its administrative center is the city of Krasnodar. The third most-populous federal subject, the krai had a population of 5,226,647 as of the 2010 Census. Overall similar living conditions of the population. North Caucasus Economic Region is one of 12 economic regions of Russia. It comprises the whole of the North Caucasian Federal District and the western federal subjects of the Southern Federal District. The peoples of the Caucasus are diverse comprising more than 50 ethnic groups throughout the Caucasus region. Adyghe Autonomous Oblast was an autonomous oblast within Krasnodar Krai, Soviet Union. It existed from 1922 to 1991. 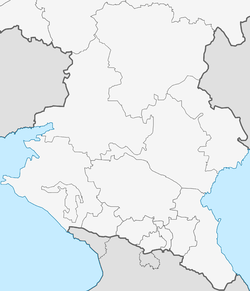 The North Caucasus Military District was a military district of the Russian Armed Forces, which became in 2010 the Southern Military District and lately also included the Black Sea Fleet and Caspian Flotilla. North Caucasus Railway is a 1,520 mm broad gauge Russian railway network that links the Sea of Azov and Caspian Sea. It runs through ten federal subjects: Rostov Oblast, Krasnodar Krai, Stavropol Krai, Republic of Adygeya, Karachay–Cherkessia, North Ossetia, Ingushetia, Chechnya, Dagestan, and Kalmykia. The headquarters are in Rostov-on-Don. North Caucasus Krai was an administrative division (krai) within the Russian Soviet Federative Socialist Republic of the Soviet Union. It was established on 17 October 1924. Its administrative center was Rostov-on-Don until 10 January 1934, Pyatigorsk until January 1936, then Ordzhonikidze and, from 15 December 1936, Voroshilovsk. The Southern Military District is a military district of Russia.